Carib PR Wire, NEW YORK, NY, Thurs. 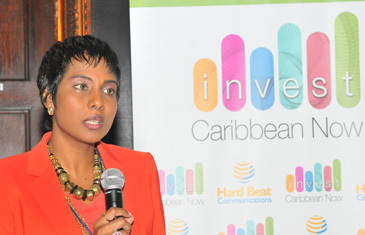 June 5, 2014: An exploratory committee to pursue the start of a micro-fund for the Caribbean will be launched in the coming months, Invest Caribbean Now (ICN) founder and chairman Felicia J. Persaud announced at the fourth ICN summit Wednesday. Persaud, delivering opening remarks to delegates gathered at the June 4th summit, said the decision is the next step in the growth of ICN. Among the top list of delegates in attendance at ICN 2014 was Dr. Ma Lin, Deputy Secretary-General of the Beijing Municipal Government; Premier of the island of Nevis; Vance Amory; Minister of Trade, Industry, Investment and Communications of Trinidad & Tobago, Senator Vasant Bharath; Minister of Tourism And International Transport, St. Kitts, Senator Ricky Skerritt; Minister of Tourism, St. Martin, Jeanne Rogers-Vanderpool; Chairman of the Caribbean Tourism Organization and Commissioner of Tourism, USVI Department of Tourism, Beverly Nicholson Doty; Chairman of the CARICOM Consular Corps of NY and Deputy Consul General, Antigua & Barbuda, Omyma David; Consul General of St. Lucia to New York, Julian DuBois; Claire McLeveighn, Vice President, Trade and Investment International Division, at the Empire State Development Corporation and Assemblyman Carmelo Garcia representing the 33rd District of Hoboken, Jersey City, Union City and Weehawken in New Jersey. Top corporate delegates were also in attendance including from Merrill Lynch, the World Bank Group; Goldman Sachs, OPIC; Sandals Resorts International; DHL Caribbean, HBO Latin America, One Caribbean Television, First Citizens TT, InvesTT, interCaribbean Airways; Bright Capital; Aegis Capital; Medici Group, Adiuvo Partners LLP, The Lugano Group, The Woody Wilson Fine Clothing of Beverly Hills; Global Med Choices, American World Clinic; Aspenall Energies; MPowered, Sir Richard Branson’s, Carbon War Room; The Goodness Compan, China Daily USA; Caribbean Commerce Magazine; NATCOM International, One Caribbean Television, FlyingICU, GeoTechVision, Auto Planet Japan Ltd., Super Green Solutions, Cayman Islands Department of Tourism, Invest Saint Lucia, K&L Gates, Lu Ning Architecture, New Sports Group, The Pont Group, Damoola Inc., the Chinese American Business Development Center, The Sino-American Friendship Association and the Russian-American Chamber of Commerce. Sandals Resorts Chairman and Founder Gordon ‘Butch’ Stewart was on hand to receive his ICN 2014 Leadership Award, which he accepted on behalf f the over 6,000 employees at Sandals. Javier Figueras, corporate vice president of Affiliate Relations at HBO Latin America, leading a team of ten to the event, accepted the ICN 2014 Alliance Award on behalf of the company which has developed affiliate relations with several Caribbean stations including TiVi S.A., the fast-growing television provider in Haiti. The One Caribbean Television team, led by Brian Lilly and including Kara Coleman, Joey Stevens and Bob Misculich accepted the ICN 2014 Media Visionary Award while First Citizens Jason Julien and Sana Ragbir received the 2014 ICN Service Excellence Award in Banking on behalf of the company. interCaribbean Airways CEO Trevor Sadler was on hand to accept the ICN 2014 Visionary Award on behalf of his chairman and company while DHL Caribbean executives, including managing director Reiner Wolfs, received the ICN 2014 Service Excellence Award in Logistics. The 2014 ICN summit was presented under the theme, “Advancing Wealth.” See more pics. here. Presenters for ICN 2014 included: Hard Beat Communications, The Caribbean Tourism Organization, One Caribbean Television, The Woody Wilson Collection of Beverly Hills, The PR Newswire, the Caribbean Commerce Magazine, Blinglets, The Caribbean Council for Economic Development, the World Tourism Cities Federation, China Daily, InvesTT, the Chinese Business Development Center, the Sino-American Friendship Association, Martinique Promotion Bureau- CMT USA, CaribPR Wire, News Americas Now, the Jamaica Observer, CaribSeek, WINN-FM and GCaribbean Magazine. Premier & Minister of Finance & Tourism of The British Virgin Islands, Dr. Orlando Smith; Minister of Tourism, St. Martin, Jeanne Rogers-Vanderpool; Minister of Economic Affairs, Curacao, Stanley Palm met with Cao, Pengcheng, Vice Chairman, Beijing Municipal Commission of Tourism Development on Tuesday June 3rd ahead of the Summit at a dinner organized by ICN's Felicia J. Persaud and Li Li of the Sino American Friendship Association. Carib PR Wire, NEW YORK, NY, Weds. June 4, 2014: A veritable list of ‘Who’s Who’ from around the globe and across the U.S. will gather at the prestigious Harvard Club in New York City today for the biggest investment summit on the Caribbean outside the region, Invest Caribbean Now, (ICN). Among the top list of delegates will be Dr. Ma Lin, Deputy Secretary-General of the Beijing Municipal Government, who is leading a delegation from China to ICN 2014. Top Caribbean dignitaries will also be in attendance at the event, including Premier & Minister of Finance & Tourism of The British Virgin Islands, Dr. Orlando Smith; Premier of the island of Nevis; Vance Amory; Deputy Premier and Minister for Tourism for the Cayman Islands, Moses Kirkconnell; Minister of Trade, Industry, Investment and Communications of Trinidad & Tobago, Senator Vasant Bharath; Minister of Tourism And International Transport, St. Kitts, Senator Ricky Skerritt; Minister of Tourism, St. Martin, Jeanne Rogers-Vanderpool; Minister of Economic Affairs, Curacao, Stanley Palm; Chairman of the Caribbean Tourism Organization and Commissioner of Tourism, USVI Department of Tourism, Beverly Nicholson Doty; Grenada’s Ambassador to the United States Angus Friday; Ambassador of the Bahamas to the UN, Dr Elliston Rahming; Chairman of the CARICOM Consular Corps of NY and Deputy Consul General, Antigua & Barbuda, Omyma David; and Consul General of St. Lucia to New York, Julian DuBois. Representing the Governor of the State of New York will be Claire McLeveighn, Vice President, Trade and Investment International Division, at the Empire State Development Corporation while investment and corporate representatives will come from a variety of sectors including finance, medical tourism and clean energy. They include Janine Craane, managing director and global institutional consultant, Merrill Lynch; Qahir Dhanani, Private Sector Development Specialist, the World Bank Group; Diana Jensen, Senior Manager, Renewable Energy at the US’ Overseas Private Investment Corporation; Gordon ‘Butch’ Stewart, Chairman of Sandals Resorts International; top executives from DHL Caribbean, HBO Latin America, One Caribbean Television, First Citizens TT and interCaribbean Airways; Mark Austin, Venture Partner, Bright Capital; Valence Williams, Aegis Capital; Woody Wilson founder of Woody Wilson Fine Clothing of Beverly Hills; Colin Childress, CEO/Founder, Global Med Choices, Turks & Caicos; Dr. Paul Angelchik, Founder and CEO, American World Clinic; Donna G. Miller, Founder, Life Guard International – FlyingICU/Fixed Wing Air Ambulance; Raul Slavin of Aspenall Energies; Jacques-Philippe Piverger of MPowered and moderator Justin Locke of Sir Richard Branson’s, Carbon War Room; Patrick Goodness, CEO, The Goodness Company, Costa Rica; Larry Lee, President, China Daily USA; Anthony Phills, branding specialist of Disney’s Million Dollar Arm and of the Caribbean Commerce Magazine; Richard Nixon, NATCOM International and past Chargé d’ Affaires at Embassy of Grenada to China; Brian Lilly, Founder, One Caribbean Television as well as the Russian-American Chamber of Commerce and the Allied African Nations Chamber Of Commerce. Top Caribbean Diaspora organizations from the U.S. and Canada will also be in attendance including Pauline Christian, President of the Black Business and Professional Association (BBPA) Dr Leroy Clarke, President and Executive Chair of e-CAMP Mentoring; Dr Marlyn Morris and the entire team from the Caribbean Council on economic Development (CCFED); The West Indian American Day Carnival Association, The Caribbean Immigrant Services and the Society for the Advancement of the Diaspora. “Advancing Wealth” is the theme of the fourth edition of the New York Summit, founded in 2011 by Hard Beat Communications CMO, Felicia J. Persaud. 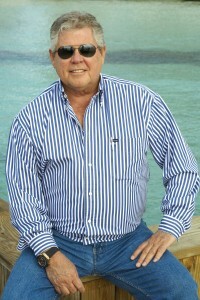 Chairman of Sandals Resorts International, Hon. Gordon “Butch” Stewart, OJ, CD, Hon. LLD, will be on hand to accept the ICN Leadership Award 2014 on June 4th in NYC. CaribPR Wire, NEW YORK, NY, Tues. June 3, 2014: Five top corporations serving the Caribbean region as well as the man who built a tourism empire from the ground up, will all be honoured in New York City tomorrow, June 4th, as Invest Caribbean Now 2014 gears up for its fourth presentation and awards reception. This year, DHL Caribbean is being presented the Service Excellence Award – Logistics for its commitment and investment in the Caribbean region and for providing Caribbean customers with quicker courier service while Trinidad & Tobago-based bank, First Citizens, will receive the Service Excellence Award – Banking for its excellent service, investment and commitment to the Caribbean region and the world, in the field of banking and for being one of the highest-rated indigenous financial institution in the English-speaking Caribbean. DHL’s Caribbean team, led by Managing Director Reiner Wolfs, will be on hand to accept the award at the ICN event in the Cambridge Room at the Harvard Club of New York from 4-6 p.m. tomorrow while First Citizens Investment Services general manager, Jason Julien, and assistant general manager, Sana Ragbir, will accept on behalf of the bank. HBO Latin America’s 10-member team, led by Javier Figueras, corporate vice president of Affiliate Relations, will receive the ICN 2014 Alliance Award for its commitment to partnership and expansion in the Caribbean region, including with TiVi S.A. – the fast-growing television provider in Haiti while One Caribbean Television’s team, led by founder Brian Lilly will be on hand to receive the ICN Media Visionary Award for its commitment to the region by its service to over millions of Caribbean nationals daily. The ICN 2014 Visionary Award for showing strategic decision to expand into a much needed inter-regional carrier in the Caribbean region, will be presented to interCaribbean Airways’s team, led by Chairman Lyndon Gardiner while the prestigious 2014 ICN Leadership Award will be presented to the Hon. Gordon ‘Butch’ Stewart, OJ, CD, Hon. 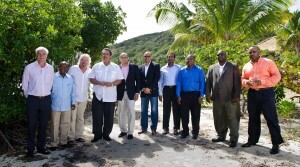 LLD, Chairman of Sandals Resorts International for commitment and dedication to the Caribbean region and its people. Stewart along with Sandals CEO, Adam Stewart and a six-member delegation will be on hand to accept the award. Meanwhile, Hollywood actor Malik Yoba will bring greetings to delegates while One Caribbean Television’s Joey Stevens and his side-kick Bob will emcee the ceremony. The awards presentation and high powered networking reception will wrap up the summit that will kick off in the Harvard Hall of the Club at 11:30 a.m. tomorrow with emcee, WNYW-TV Emmy-winning news anchor, Ernie Anastos; a prayer of prosperity by Rev. Dr. Belgrave Pelle, Dean of the Anglican Church of America; a New York State Welcome by Claire McLeveighn, Vice President of Trade and Investment at Empire State Development and a Beijing Welcome by Dr. Ma, Lin, Deputy Secretary-General of Beijing Municipal Government. The summit will then move into several panel discussion including: Global Trends & The Caribbean; Beijing-Caribbean Tourism And Investment Opportunity; Introducing The New Trend In Tourism – Medical Tourism; Introducing A New Trend In The Caribbean – Clean Energy and the Caribbean Diaspora as a source of investment. Additionally, the first half of the event will include an opening address by ICN founder and chairman, Felicia J. Persaud; a keynote address by Harvard graduate Dr. Isaac J. Newton, of Paramount Communications Consultancy; a spotlight on specific investment opportunities in Trinidad & Tobago with Minister of Trade, Industry, Investment and Communications, Sentor Vasant Bharath; an investment announcement on the Caribbean Market Village of St. Lucia and a focus on ‘Advancing Wealth In The Caribbean With Technology,’ from Trinidad-born, LA resident, Anthony Wellington Phills, branding specialist of Disney’s ‘Million Dollar Arm’ and founder of Caribbean Commerce Magazine/Media, Calypso Cloud and Blinglet Inc.
CaribPR Wire, NEW YORK, NY, Tues. May 27, 2014: “Advancing Wealth” is the theme of the fourth edition of the New York Summit, Invest Caribbean Now, the biggest investment forum on the Caribbean outside the region, set for June 4, 2014 at the prestigious Harvard Club of New York. CaribPR Wire, NEW YORK, NY, Mon. May 19, 2014: A top level delegation comprising of officials from the Beijing government, the World Tourism Cities Federation, as well as the Beijing Municipal Commission of Tourism Development and China Daily, will travel to New York this June 4th for the biggest global investment summit on the Caribbean outside the region, Invest Caribbean Now, (ICN). The delegation is being brought to ICN by partnering groups, The Chinese American Business Development Center of New York and The Sino-American Friendship Association, and will include Dr. Ma, Lin, the Deputy Secretary-General of the Beijing Municipal Government with responsibility for science, information technology, tourism, software development, education in Beijing and Mr. Cao, PengChen, vice chairman of the Beijing Municipal Commission of Tourism Development. The Chinese American Business Development Center of New York and its managing director, Li Li, began collaborating with Hard Beat Communications, the producers of the annual investment summit last year. The 2014 Summit will mark an expansion on that collaboration that will include not only the arrival of the Chinese delegation to the New York Summit but a two-nation Caribbean trade mission to the Caribbean later this year. Nearly every island in the Caribbean, from the smallest up, currently has a substantial investment from China. In 2009, China pledged US$7 billion in foreign direct investment to the region. According to recent tourism statistics, approximately 55 million Chinese traveled internationally in 2010, spending an estimated amount of US$42 billion – three times the 18 million overnight visitors from around the globe that the Caribbean attracted that year. The Boston Consulting Group predicts that by 2020, outbound travel from China will be worth US$590 billion so many Caribbean nations are anxious to obtain a piece of that pie. This year’s fourth Invest Caribbean Now summit will also feature numerous global professional investors, entrepreneurs and business leaders including from the World Bank Group, OPIC, Merrill Lynch, Aegis Capital, the International diaspora Engagement Alliance, (IdEA); InvesTT, Sandals International Resorts, Sir Richard Branson’s Carbon War Room; One Caribbean Television, China Daily, First Citizens TT; HBO Latin America, interCaribbean Airways; DHL Caribbean, Tia Properties, American CryoStem Corporation, Lugano Group, Damoola, Island Global Yachting, Blocadi Capital, Bright Capital, MPowered, Aspenall Energies, K&L Gates, Global Med Choices, American World Clinics, The Goodness Company and Paramount Communications. Also attending will be Hollywood Actor Malik Yoba; Designer to the stars, Woody Wilson; Chairman of Sandals Resorts International, Gordon ‘Butch’ Stewart and Caribbean government ministers and dignitaries from across the region including Premier of Nevis, Vance Amory; Moses Kirkconnell, Deputy Premier and Minister for Tourism for the Cayman Islands; Minister of Trade, Industry, Investment and Communications, Trinidad & Tobago, Vasant Bharath; Minister of Agriculture of Barbados, Dr. David Estwick; Minister of Tourism & International Transport of St. Kitts, Ricky Skerritt; Jeanne Rogers-Vanderpool, Minister of Tourism, St. Martin as well as representatives from Puerto Rico, Montserrat and Martinique. Multiple Award Emmy winning TV Anchor, Ernie Anastos, will emcee the Summit while One Caribbean Television weatherman, Joey Stevens, and his famous side-kick, Bob, will wrap up the event by hosting the ICN Awards Reception, set for 4:30 to 6:30 p.m. This year’s honorees will include DHL Caribbean, HBO Latin America, First Citizens TT, One Caribbean Television, interCaribbean Airways and Gordon ‘Butch’ Stewart, the chairman and founder of Sandals Resorts International. The panel at ICN, the biggest summit on the Caribbean outside the region, comes on the heels of Branson and the Carbon War Room’s ‘10 Island Renewable Challenge,’ issued in February on Necker Island in the British Virgin Islands. The plan is to encourage Caribbean nations to switch away from fuel oil and move to low or zero-carbon energy that will not just help keep the air clean but reduce overall energy costs. The average cost of electricity across the Caribbean ranges from $0.30 per kilowatt hour (KWh) to $0.65/KWh – roughly three to six times the price paid in the continental US. Justin Locke, Director of Islands at CWR, will moderate the panel which will include Diana Jensen, the director of Renewable Energy Finance at the U.S. government’s development finance institution, the Overseas Private Investment Corporation, (OPIC); Raul Slavin, managing director of Aspenall Energies; Mark Austin, a venture partner at Bright Capital and Jacques-Philippe Piverger, the CEO and co-founder of MPowered. Meanwhile, multiple-award Emmy winning TV Anchor, Ernie Anastos, will emcee the Summit beginning at 11:30 a.m. on June 4th while Dr. Ma, Lin, Deputy Secretary-General of Beijing Municipal Government will bring greetings from China and Caribbean scholar Dr. Isaac Newton will deliver the key note address. Trinidad & Tobago’s Minister of Trade, Industry, Investment and Communications, Senator Vasant Bharath will put the spotlight on investment opportunities in the twin-island Republic while Sheila Newton-Moses will put the project spotlight on the Caribbean Market Village of St. Lucia. Other panels at the summit will also include ‘Global Trends & The Caribbean’ featuring Janine Craane of Merrill Lynch; Valence Williams of Aegis Capital; Sergio Millian, of the Russian-American Chamber of Commerce and Anthony A. L. Adjasse of the Allied African Nations Chamber Of Commerce and ‘Medical Tourism – The New Trend In Caribbean Tourism,’ with Colin Childress, CEO of Global Med Choices, Turks & Caicos; Paul Angelchik, chairman of American World Clinics and Patrick Goodness, CEO of The Goodness Company of Costa Rica among others. Additionally, there will be a panel on the ‘Emerging Relationship Of Chinese Tourism & Investments In The Caribbean,’ featuring Cao, PengCheng of the Beijing Municipal Commission of Tourism Development and Li Li, executive director of the Chinese American Business Development Center among others. This year’s featured interview will focus on the ‘Caribbean Diaspora As An Investment Source’ with Qahir Dhanani of the World Bank Group; Leigh Moran of the US State Department and USAID’s IdEA and Irwine Clare of the Caribbean Immigrant Services. One Caribbean Television weatherman, Joey Stevens, and his famous side-kick, Bob, will host this year’s ICN Awards Reception, set for 4:30 to 6:30 p.m. It will include remarks from Hollywood Actor Malik Yoba and the presentation of awards to Chairman of Sandals Resorts International, Gordon “Butch” Stewart, who will receive the 2014 Invest Caribbean Now Leadership Award. Past ICN honorees have included Sir Richard Branson, founder of Virgin Group and Royal Caribbean Cruises International. Five corporations from across the region will also be honoured. They include interCaribbean Airways, One Caribbean Television, First Citizens TT, DHL and HBO Latin America. Presenters for ICN 2014 include: Hard Beat Communications, The Caribbean Tourism Organization, One Caribbean Television, The Woody Wilson Collection of Beverly Hills, The PR Newswire, the Caribbean Commerce Magazine, Blinglets, The Caribbean Council for Economic Development, the World Tourism Cities Federation, China Daily, InvesTT, the Chinese Business Development Center, the Sino-American Friendship Association, Woody Wilson Fine Clothing, Martinique Promotion Bureau- CMT USA, CaribPR Wire, News Americas Now, the Jamaica Observer, CaribSeek, WINN-FM and GCaribbean Magazine. So insists Chairman of Sandals Resorts International, Hon. Gordon “Butch” Stewart, OJ, CD, Hon. LLD, the man who built a tourism empire in the Caribbean from the ground-up and today remains active in investments across the region. 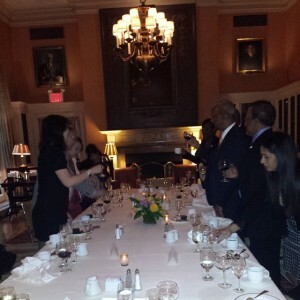 The Jamaican-born Stewart’s pearls of wisdom to global investors come as he gears up to receive the 2014 Invest Caribbean Now Leadership Award this June 4, 2014 at the Harvard Club in New York City. “My work here, the companies I have built, the jobs we have created and the people we have served are the best example of what is possible in the Caribbean and why we must continue to invest here at home,” he added. Multiple-Award Emmy winning TV Anchor, Ernie Anastos, will emcee the Summit beginning at 11:30 a.m. on June 4th while Dr. Ma, Lin, Deputy Secretary-General of Beijing Municipal Government will bring greetings and Caribbean scholar Dr. Isaac Newton will deliver the key note address. Trinidad & Tobago’s Minister of Trade, Industry, Investment and Communications, Senator Vasant Bharath will put the spotlight on investment opportunities in the twin-island Republic and Sheila Newton-Moses will put the project spotlight on the Caribbean Market Village. Panels at the summit will include ‘Global Trends & The Caribbean’ featuring Ambassador Dr. Richard Bernal of the Inter-American Development Bank; Janine Craane of Merrill Lynch; Valentin Romanov, Sun Energy, Russia; Sergio Millian, of the Russian-American Chamber of Commerce and Anthony A. L. Adjasse of the Allied African Nations Chamber Of Commerce and ‘Medical Tourism – The New Trend In Caribbean Tourism,’ with Colin Childress of Global Med Choices, Turks & Caicos; Paul Angelchik of American World Clinics and Patrick Goodness of The Goodness Company of Costa Rica among others. Additionally, there will be a panel on ‘Clean Energy and the Future of the Caribbean’ with Justin Locke of Sir Richard Branson’s Carbon War Room; Diana Jensen of OPIC; Mark Austin of Bright Capital and Jacques-Philippe Piverger of MPowered as well as a panel on the ‘Emerging Relationship Of Chinese Tourism & Investments In The Caribbean,’ featuring Cao, PengChen of the Beijing Municipal Commission of Tourism Development among others. 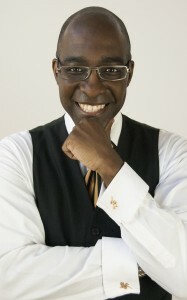 One Caribbean Television weatherman, Joey Stevens, and his famous side-kick, Bob, will host this year’s ICN Awards Reception, set for 4:30 to 6:30 p.m. It will include remarks from Hollywood Actor Malik Yoba and the presentation of awards to Sandals’ Stewart and four corporations from across the region. Persons looking to do business with top Chinese, Caribbean and Russian delegates can ask about one of ten Diamond Room tickets at $1,000 from Joe Bernstein at joe@investcaribbeannow.com. Presenters for ICN 2014 include: Hard Beat Communications, The Caribbean Tourism Organization, One Caribbean Television, The Woody Wilson Collection of Beverly Hills, The PR Newswire, the Caribbean Commerce Magazine, Blinglets, The Caribbean Council for Economic Development, the World Tourism Cities Federation, China Daily, InvesTT, the Chinese Business Development Center, the Sino-American Friendship Association, Woody Wilson Fine Clothing, CaribPR Wire, News Americas Now, the Jamaica Observer, CaribSeek, WINN-FM and GCaribbean Magazine. CaribPR Wire, NEW YORK, NY, Mon. April 28, 2014: Caribbean-born entrepreneur and brand specialist, Anthony Phills, whose work can now be seen in Disney Pictures upcoming film, Million Dollar Arm, will be among the presenters at Invest Caribbean Now 2014. The Los Angeles resident and founder of Caribbean Commerce Magazine/Media, Calypso Cloud and Blinglet Inc., whose roots stretch to Trinidad and Tobago, will speak on how the Caribbean can harness technology as a way to advance wealth in the region. Phills created the branding for ‘The Million Dollar Arm’ contest, a talent hunt competition in India that led to the discovery of the first two professional baseball pitchers from India. The story of these two pitchers and the agent who found them inspired Disney Pictures’ upcoming movie, Million Dollar Arm, starring Jon Hamm. It will be released May 16th in theaters. Staying true to the real story, Phills’ original designs can be seen in the film. Phills also serves as the Chief Technical Officer of Invest Caribbean Now and sits on the new ICN board. 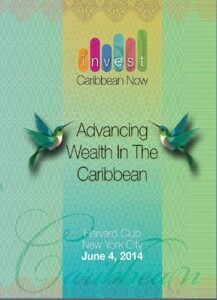 Invest Caribbean Now 2014, (ICN), the biggest global investment summit on the Caribbean outside of the region, is set for the Harvard Club in New York City from 11:30 a.m. to 6:30 p.m. this June 4, 2014. This year’s fourth Invest Caribbean Now Summit will feature numerous global professional investors, entrepreneurs, and business leaders including Hollywood Actor Malik Yoba; Chairman of the billion-dollar, privately-owned Jamaican-based empire, Gordon ‘Butch’ Stewart; Sergio Millian, President of the Russian American Chamber of Commerce; Colin Childress, CEO/Founder, Global MedChoices, Turks & Caicos; Paul Angelchik, M.D., Founder and CEO, American World Clinic – Barbados; Anthony A. L. Adjasse of the Allied African Nations Chamber Of Commerce; Hollywood actor Malik Yoba, Hollywood fashion designer, Woody Wilson; Qahir Dhanani, private sector development specialist of the World Bank Group; Ambassaodr Dr. Richard Bernal, Executive Director, Caribbean, Inter-American Development Bank, Leigh Moran, manager, International Diaspora Engagement Alliance” or “IdEA,” a partnership of the US State Department and USAID; Brian Lilly, founder of One Caribbean Television and CEO of Lilly Broadcasting and executives from Sun Group Russia, Tia Properties, LLC, American CryoStem Corporation, Lugano Group, Damoola, Merrill Lynch, Nomura, Aegis Capital, Island Global Yachting, Blocadi Capital, K&L Gates, True Value Building & Hardware Ltd & Emerald Vista, DHl, First Caribbean Group, InvestTT, Martinique Promotion Bureau- CMT USA, and Sir Richard Branson’s Carbon War Room. Also in attendance will be Chinese and Caribbean government ministers and dignitaries including Dr. Ma, Lin Deputy Secretary-General of Beijing Municipal Government, Premier of Nevis, Vance Amory; Minister of Trade, Industry, Investment and Communications, Trinidad & Tobago Vasant Bharath; Minister of Agriculture of Barbados, Dr. David Estwick; Minister of Tourism & International Transport of St. Kitts, Ricky Skerritt; Jamaica’s Ambassador to the UN, Courtney Rattray; several CARICOM consuls general to New York and the Secretary General of the Caribbean Tourism Organization, Hugh Riley. Multiple Award Emmy winning TV Anchor, Ernie Anastos, will emcee the Summit while One Caribbean Television weatherman, Joey Stevens, and his famous side-kick, Bob, will wrap up the event by hosting the ICN Awards Reception, set for 4:30 to 6:30 p.m.
Limited early bird tickets and table of 10 are available through April 30th by booking here or at investcaribbeannow.com/earlybird while some partnership sponsorship and advertising opportunities for this event are still available by contacting sheila@investcaribbeannow.com or chris@caribpr.com or by logging on to ICN’s summit page at Investcaribbeannow.com. Persons looking to do business with the top Chinese, Caribbean and Russian delegates can ask about one of ten Diamond Room tickets from Joe Bernstein at joe@investcaribbeannow.com for a cost of $1,000 each. Presenters for ICN 2014 are: Hard Beat Communications, The Caribbean Tourism Organization, One Caribbean Television, The Woody Wilson Collection of Beverly Hills, The PR Newswire, The Caribbean Commerce Magazine, Blinglets, The Caribbean Council for Economic Development, the Chinese Business Development Center, Martinique Promotion Bureau- CMT USA, CaribPR Wire, News Americas Now, the Jamaica Observer, CaribSeek, WINN-FM and GCaribbean Magazine. That’s the advice of Antigua-born scholar, Dr. Isaac Newton, as he gears up to deliver the keynote address to delegates at Invest Caribbean Now 2014, (ICN), the biggest global investment summit on the Caribbean outside of the region, set for the Harvard Club in New York City from 11:30 a.m. to 6:30 p.m. this June 4, 2014. Dr. Newton in a preview of his speech at ICN, said regional leaders must create the right mix of incentives to attract both globally reputable and Diaspora investors. “Such mutually rewarding behaviours enhance brand recognition and engender wider appeal – in the Caribbean and around the world – for their products/services and make the Caribbean a happier place for all,” said the Paramount Communications executive. Dr. Newton also encourages businesses and government leaders to capitalize on the serious global challenges facing the Caribbean, as these relate to the impact of investments on the socio-economic improvement of the wider population. This year’s fourth Invest Caribbean Now summit will feature numerous global professional investors, entrepreneurs, and business leaders including Hollywood Actor Malik Yoba; chairman of the billion-dollar, privately-owned Jamaican-based empire, Gordon ‘Butch’ Stewart; Sergio Millian, President of the Russian American Chamber of Commerce; Colin Childress, CEO/Founder, Global MedChoices, Turks & Caicos; Paul Angelchik, M.D., Founder and CEO, American World Clinic – Barbados; Anthony A. L. Adjasse of the Allied African Nations Chamber Of Commerce; Hollywood actor Malik Yoba, Hollywood fashion designer, Woody Wilson; Qahir Dhanani, private sector development specialist of the World Bank Group; Leigh Moran, manager, International Diaspora Engagement Alliance” or “IdEA,” a partnership of the US State Department and USAID; Brian Lilly, founder of One Caribbean Television and CEO of Lilly Broadcasting and executives from Sun Group Russia, Tia Properties, LLC, American CryoStem Corporation, Lugano Group, Damoola, Merrill Lynch, Nomura, Aegis Capital, Island Global Yachting, Blocadi Capital, K&L Gates, True Value Building & Hardware Ltd & Emerald Vista and Sir Richard Branson’s Carbon War Room. Also in attendance will be Caribbean government ministers and dignitaries from across the region including Premier of Nevis, Vance Amory; Minister of Trade, Industry, Investment and Communications, Trinidad & Tobago Vasant Bharath; Minister of Agriculture of Barbados, Dr. David Estwick; Minister of Tourism & International Transport of St. Kitts, Ricky Skerritt; Jamaica’s Ambassador to the UN, Courtney Rattray; several CARICOM consuls general to New York and the Secretary General of the Caribbean Tourism Organization, Hugh Riley. Persons looking to do business with the top Chinese, Caribbean and Russian delegates can ask about one of ten Diamond Room tickets from Joe Bernstein at joe@investcaribbeannow.com. Presenters for ICN 2014 are: Hard Beat Communications, The Caribbean Tourism Organization, One Caribbean Television, The Woody Wilson Collection of Beverly Hills, The PR Newswire, the Caribbean Commerce Magazine, Blinglets, The Caribbean Council for Economic Development, the Chinese Business Development Center, Woody Wilson Fine Clothing, CaribPR Wire, News Americas Now, the Jamaica Observer, CaribSeek, WINN-FM and GCaribbean Magazine.